Your organization has done a great job explaining to members why it’s important to vote: It gives them a voice in the mission and operations of the organization, voting ensures the organization operates at its best, fullest capacity, voting is your democratic duty, etc. But your voting numbers just aren’t increasing the way you’d like them to. 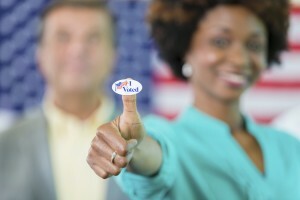 What to do when you need to increase engagement and get your members to cast their ballots? Enlist members to get their fellow members to vote! Believe it or not, “I Voted” stickers are a hot commodity. Since they were introduced in the 1980s, these simple little stickers have served as a reminder that an election is taking place and badge of honor to those who’ve cast their votes. Since many member organizations conduct their elections over a period of weeks (not only one day), it’s helpful to put together a “Show us your sticker” campaign. Ask members to share photos of themselves with an “I Voted” message on your social media sites or submit them to your organization’s website. When people see their fellow members proudly showing off the fact they voted, it builds the sense of community and obligation that comes with voting. Offering additional incentives such as prize drawings or free coffee “thank you” certificates can also create a buzz and give members an additional reason to cast their ballots. If your organization holds an election online, be sure to include social sharing buttons at the end of the voting process. Members can then tell the world on their own social sites that they voted in the election. This builds awareness and offers a reminder (and even a little push) for other members so they vote as well. Remember to use your organization’s own social media sites, such as LinkedIn, Facebook, Instagram and Twitter, to promote election participation among members. Just as “I Voted” campaigns can be an effective tool to get members to ensure their voices are heard, asking members to sign a non-binding pledge or make a commitment to vote can be a great way to announce an upcoming election. Not only will members have the heads-up that an election is around the corner, if they sign a pledge to vote, they’ll have the added nudge to actually cast their ballot. And you know you’ve got an engaged member base to mobilize in future elections promotions! If you have any well-known members, enlist their assistance to promote the election. Share photos of them with their “I Voted” stickers and ask them to participate in the organization’s get out the vote efforts. If nothing else, remind your members that even the astronauts manage to cast their votes from space, so there are no excuses for not voting. When your organization has a strategy to make your election impossible to ignore and your voters visible, you can increase voting rates and engage members. If you need more ideas on why your members aren’t voting and how to enlist your members to encourage each other to vote, check out our FREE eBook here or contact us, we’re here to help! Next Next post: What Are You Doing With Your Member Data?